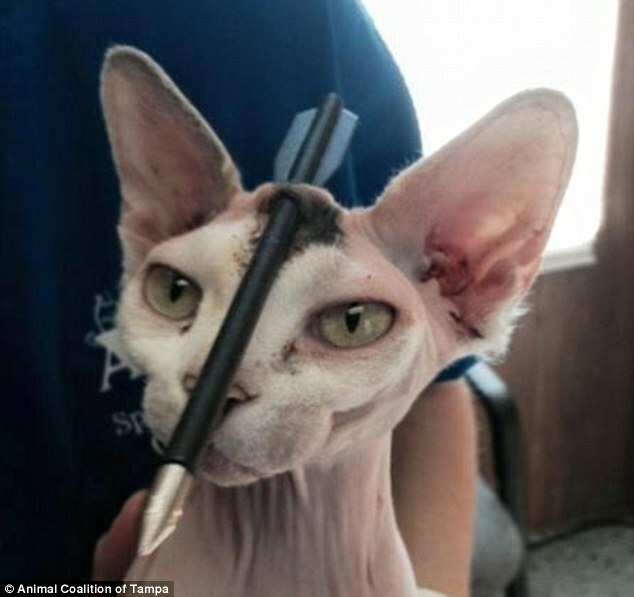 Akila, a seven-year-old calico Sphynx, was found by her owner, Tyra Bulluck, 40, cowering in bushes in a neighbor’s yard with a seven inch arrow that had been fired right between the terrified cat’s eyes. The projectile had deflected off Akila’s skull, only going under the surface of the skin. Had it hit from a different angle and pierced the skull, it would have meant instant death. Akila, a strictly indoor cat, had got out of the family’s home in Riverside, Florida, 12 miles south of Tampa, on Tuesday, and it was not until Wednesday morning that her owners made the disturbing discovery. Akila was rushed to the Animal Coalition of Tampa where she underwent emergency surgery performed by veterinarian Elaine Foley to remove the arrow. The 45-minute operation was successful and Akila was allowed to go home.